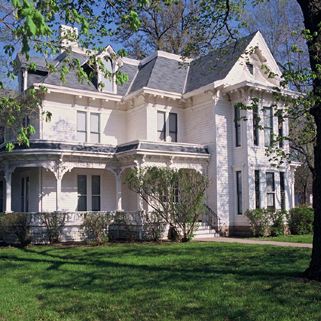 Independence, Missouri is best known historically as the trailhead for the Santa Fe Trail and as the home of President Harry Truman. In the mid-nineteenth century, Independence was the gateway to the west, as wagon trains gathered in the city’s large central square to be fitted out for the long journey to the southwest. Today, at the center of the square is the county courthouse where Harry Truman served as Presiding Judge before being elected to the US Senate. Through its association with Truman, Independence has been heralded for its small-town American values. Less well known is the city’s history as a streetcar suburb of Kansas City. Late nineteenth and early/mid-twentieth century growth expanded the city's boundaries to include 78 square miles. The preservation plan for Independence identified landscape character areas throughout the city and developed preservation strategies for each character area appropriate to its individual goals, resources, and significance. Character-defining features were identified and long-term recommendations outlined for the preservation of historic resources and strengthening of community character.